The Udupi Sri Krishna Matha is a Hindu temple dedicated to the worship of Lord Krishna and is located at Udupi, Karnataka. The temple resembles an ashram and is surrounded by many temples which are over 1000 years old. One unique feature of this temple is that the Sri Krishna can only be viewed through a window with nine holes in it. This window is silver plated and exquisitely carved. It is a tradition that the deity is worshipped only through this window. Rukmini, the consort of Lord Krishna wished to see him in an infant form and requested Mayan, the sculptor to sculpt her such an idol. He made a sculpture that depicted her wishes. It had the curd churning stick in one hand and butter in the other hand. Mesmerized with the beauty of the idol, Rukmini kept the idol with her and performed pujas to it. This idol later passed on to Arjuna and is now safe in the temple. The temple functions continuously between 4.30 am to 9.00 pm. 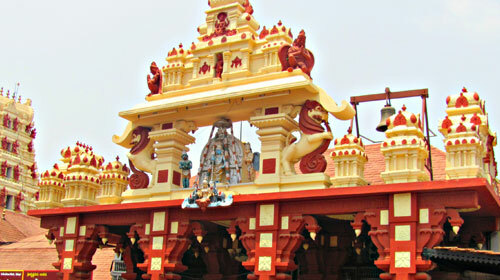 The Vasantha summer festival is celebrated with much grandeur at the temple. Other festivals include Sri Ram Navami, Sri Krishna Jayanthi and Navarathri.